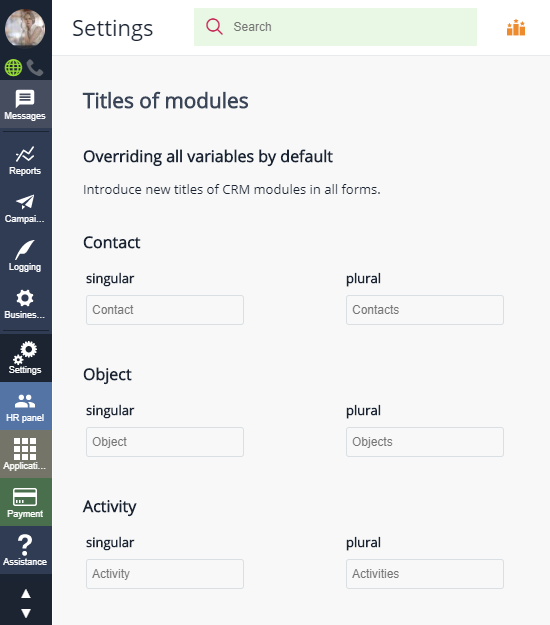 You can change the titles of all basic CRM modules — "Contacts", "Objects", "Deals", "Activities". For instance, if you are a car dealer and have cars as your company's objects — you can easily adjust the system interface to respond to your company's needs. Changing a module title will affect any part of the CRM interface it is mentioned in: menu options, tabs, etc. Please note: depending on the nature of the language selected, you might need to submit new module titles in all cases, declinations and numbers — to provide for the correct title output in all parts of the interface.